There’s been a recent uptick in the number of unaccompanied minors and families crossing the Texas border illegally. In December, Governor Greg Abbott said he was responding by sending more state troopers to the border and keeping the state national guard in place there. Sheriff McDonald’s the current head of a group of 21 Texas border sheriffs who agree in principal with Abbott and other Republicans that the border needs to be tightened up, but they disagree about how to do it. At the center of that disagreement is money. 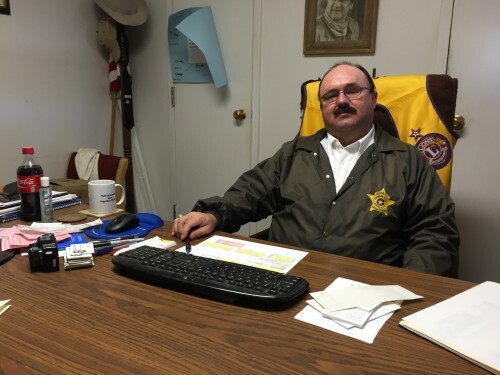 “If give that money to the local sheriffs, and let them hire more deputies, they’re gonna be able to know the difference between somebody who lives down the street and somebody who’s just crossed the river yesterday,” he says. “These are children. Children that are very vulnerable,” he says. Governor Abbott’s office didn’t respond to a request for comment about the sheriffs’ concerns, but McDonald says he’s still hoping to meet with the governor at some point about all this. This entry was posted in KRTS News and tagged Border Policy, Border Security, Border Security Funding, Border Sheriffs, Crime, Immigration, Law Enforcement, Texas Border Sheriffs Coalition, Texas DPS. Bookmark the permalink.